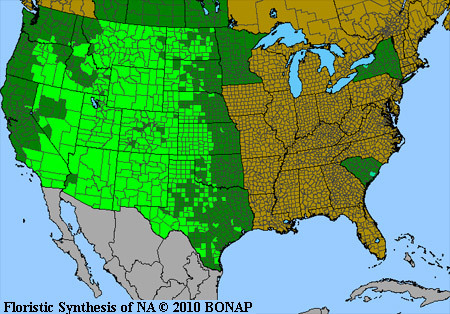 Both Gutierrezia sarothrae and Gutierrezia microcephala are found over wide areas of the United States: Gutierrezia microcephala is found from far west Texas to southern California and from the very southwest corner of Colorado to central Nevada. Gutierrezia sarothrae is found in the same area and also farther north through all the western states and into Canada. (It is also found in South America.) 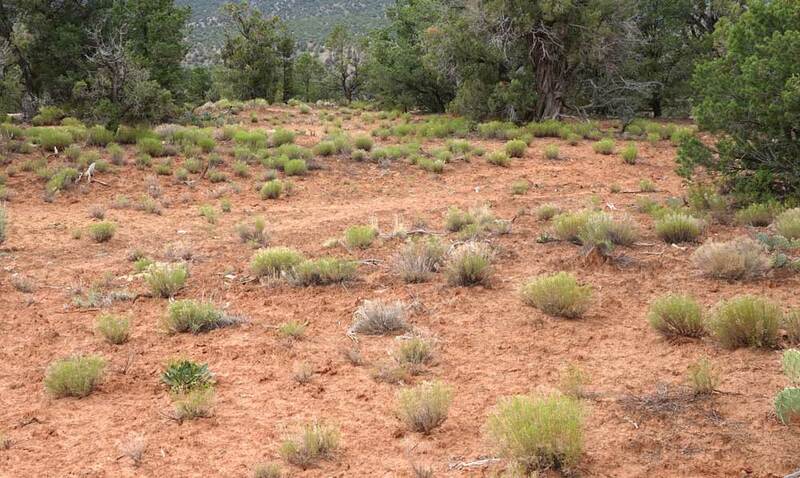 The two species are often in the company of that other ubiquitous Westerner, Sagebrush, Artemisia tridentata. In the Four Corners area Gutierrezia sarothrae by far outnumbers Gutierrezia microcephala. 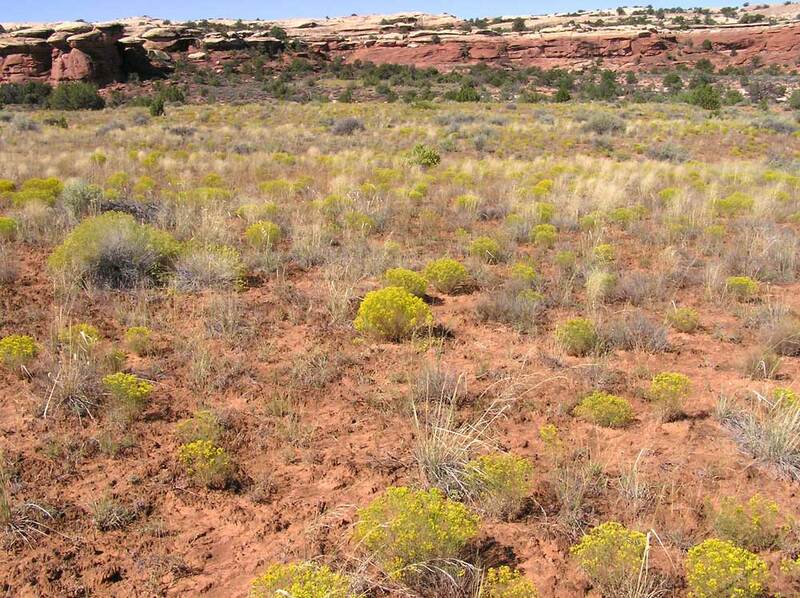 The recently discovered Gutierrezia elegans (click to see) is found just in Dolores County, Colorado. Both G. sarothrae and G. microcephala often grow in extensive patches, especially at road side and on grazed land where the plants spread easily because cattle dislike them. Gutierrezia microcephala and Gutierrezia sarothrae are quite similar and one needs a bit of determination and a hand lens to tell the difference between the two. Both grow in the same environment, often right next to each other; both have minute flowers; both have the same rounded appearance and grow to the same height of one to three feet; both flower in late summer and fall. The most easily observed difference is in the flowers: G. microcephala has only one or two of both ray and disk flowers; G. sarothrae has three to seven ray and disk flowers. From a specimen collected in 1804 by Meriwether Lewis on "the plains of the Missouri", Frederick Pursh (in 1814) named Solidago sarothrae. 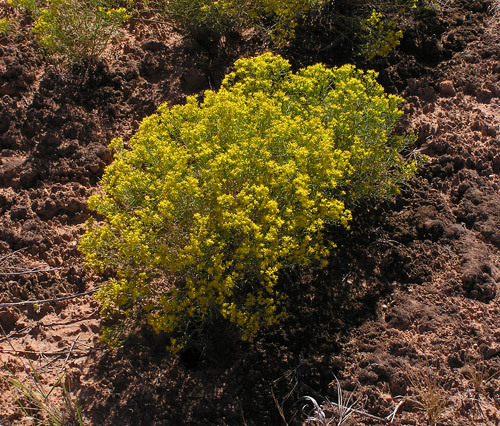 In his description of Gutierrezia linearifolia, Lagasca did not specify who he was honoring with the genus name. For some reason, though, it has been assumed that the name honors Pedro Gutierrez, variously described as a Spanish nobleman, traveler, or Real Jardin correspondent. In 1887 Britton and Rusby re-examined the plants named by Lagasca and Pursh and realized that they were the same species and should be in the Gutierrezia genus. Since Pursh's description was published first (1814 versus 1816) the species retained sarothrae as its specific epithet. 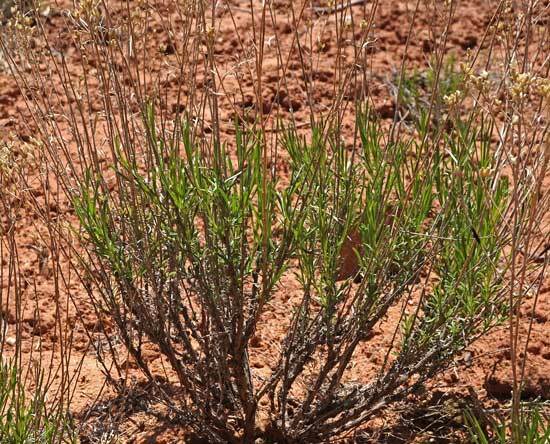 Thus the accepted name for both Sesse and Mocino and Lewis' discovery is Gutierrezia sarothrae. "Sarothrae" is from the Greek for "broom" and "microcephala" is Greek for "small head". 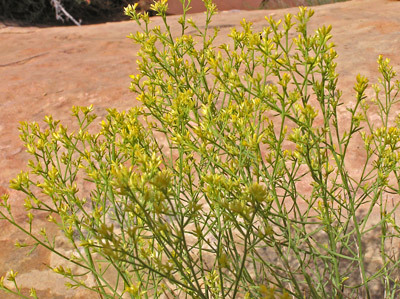 Click for Gutierrezia elegans, a new species that Peggy Lyon and I discovered August 4, 2008 in Lone Mesa State Park, Dolores County, Colorado. Semi-desert, foothills. Openings, roadsides. Summer, fall. Butler Canyon, Utah, August 27, 2007. 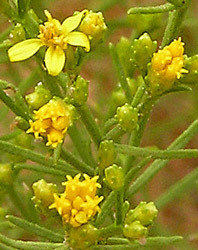 Flowers are crowded at the top of very slender stems. The plant grows along trails, at roadsides, in sandy and rocky areas, and in pastures. G. microcephala was first named Brachyris microcephala by Augustin de Candolle in 1836 from a collection made by Berlandier in Mexico. 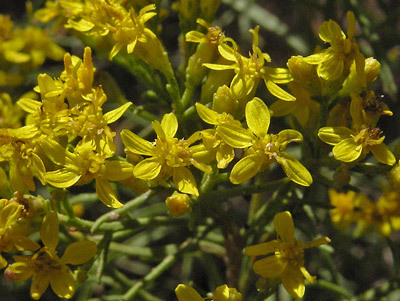 Asa Gray renamed the plant Gutierrezia microcephala in 1849. Gutierrezia sarothrae (Gutierrezia), Petradoria pumila (Rock Goldenrod), and the various species of Chrysothamnus and Ericameria (Rabbitbrushes) are often difficult to tell apart. Click for some assistance. Notice all the single ray flowers. When I first saw such flowerheads, I thought that the other ray flowers had dropped and that I was looking at G. sarothrae. This plant also has only one disk flower per head. Leaves are very similar to those of G. sarothrae: 2-5 centimeters long and 2-4 millimeters wide, but the one ray flower per flowerhead sets this species off. Canyons of the Ancients National Monument, August 9, 2019 and March 9, 2017. Gutierrezia sarothrae spreads widely over many acres of land. At flowering time it imparts a golden tint to Canyon Country sands. 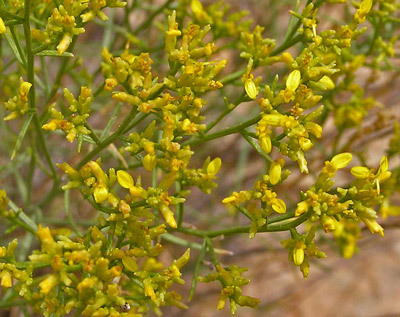 Dried floral parts persist through the winter so, as the third photograph above shows, Gutierrezia sarothrae is still very conspicuous long after its flowers are gone. Gutierrezia sarothrae is often regarded as a non-native weed, but it is not. It is a native and lovely plant. When you see beautiful expanses of Gutierrezia it is often because cattle have been on that land and reeked havoc with the natural plant community. 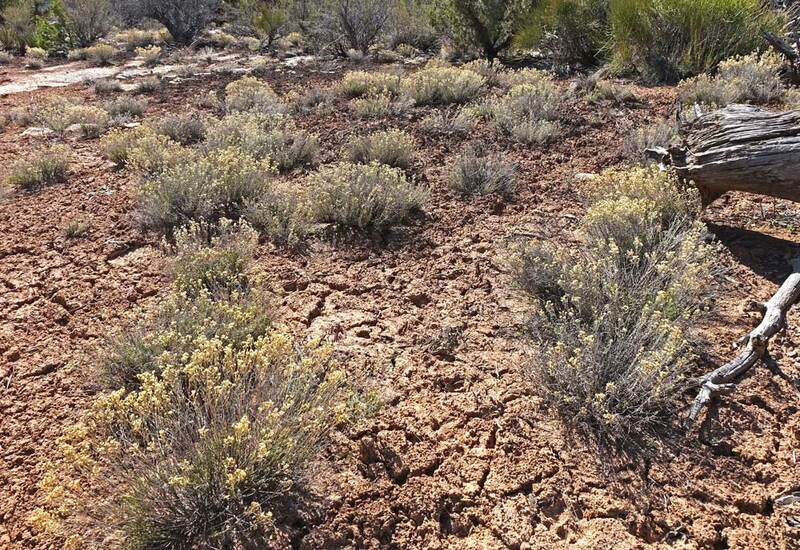 Since cattle do not eat Gutierrezia, when the cattle over-graze other plants they make room for Gutierrezia to spread. Gutierrezia sarothrae is often confused with Petradoria pumila which also puts on a massive display of yellow clusters of flowers, but the latter usually blooms earlier in June and July, is not woody, is shorter in more cylindrical clusters, and has much longer leaves and more golden flowers. 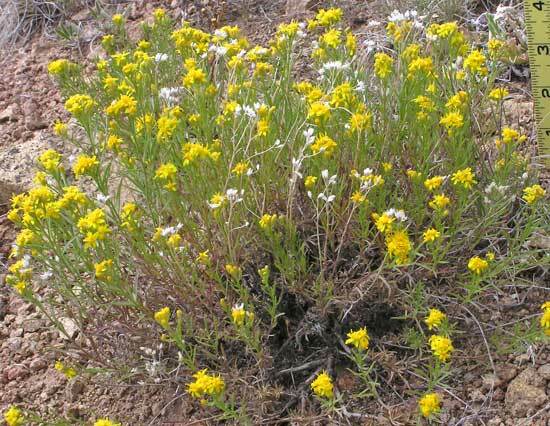 Click to see a comparison of Gutierrezia, Petradoria, and Ericameria, three species which can be difficult to separate, especially when the three are young. Big Spring Trail, Canyonlands National Park, Utah, September 10, 2005. Lower leaves on both species of Gutierrezia shown on this page are often withered at flowering time. 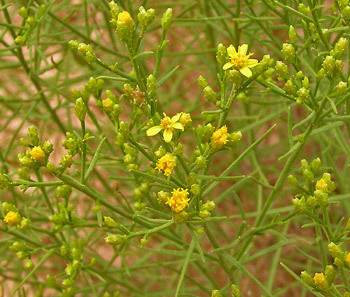 Flowers are clustered tightly at the top of the plant. The top photograph at left shows a plant many years old, over fifteen inches tall, and thirty inches in diameter. The next photograph shows a young, very vigorous plant just a few years old with the previous year's dried flower stems still showing but many more flower stems from the most recent year. 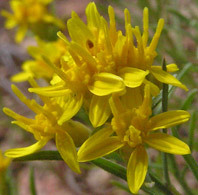 As indicated above, Gutierrezia sarothrae was first collected for science by Meriwether Lewis along the Missouri River in 1804 and was named Solidago sarothrae by Pursh in 1814. 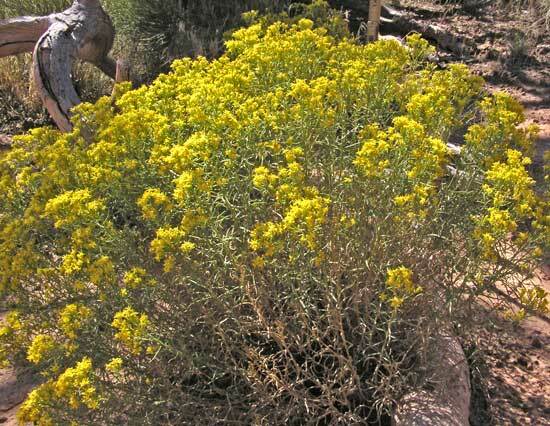 It was also named Gutierrezia linearifolia by the Spanish botanist La Gasca, who originated the Gutierrezia genus. In 1857 the plant was renamed Gutierrezia sarothrae by Britton and Rusby. "Sarothrae" is from the Greek, "sarotron", meaning "broom". Big Spring Trail, Canyonlands National Park, Utah, September 10, 2005. Prairie Dog Knoll, Abajo Mountains, Utah, August 17, 2009. Butler Canyon, Utah, August 27, 2007. Flowers often do not look as uniform and symmetrical as shown at left or in the first photograph immediately below. The second photograph below shows varying stages of flowerhead development: the flower cluster at top left has both ray and disk flowers; the two largest flower clusters below that one have only disk flowers. What appear to be rays on the disk flowers are just lobes on the disk flower tube. Leaves are 2-7 centimeters long and 1-3 millimeters wide and range from mostly linear to lanceolate, to oblanceolate or spatulate. 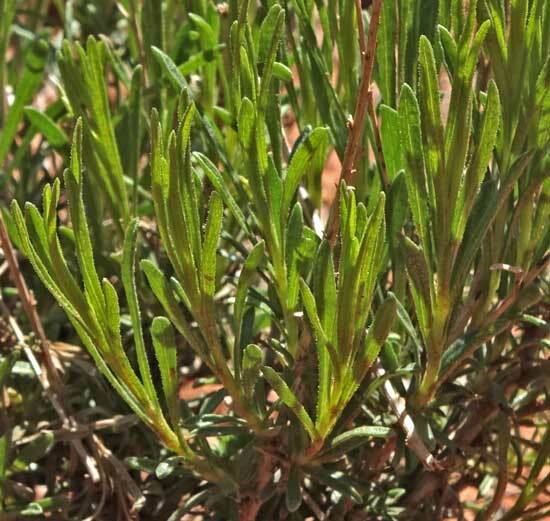 The upper leaves are usually smaller than the lower. Big Spring Trail, Canyonlands National Park, Utah, September 10, 2005 and Canyons of the Ancients National Monument, October 21, 2010. Multiple, leaning stems give rise to a rounded symmetrical crown which is densely covered with bright golden yellow small flowers. In Canyon Country the golden glow contrasts strikingly with the rich orange soils and dark black/brown of the Cryptobiotic Soil Crust, the community of lichens and cyanobacteria so fragile, beautiful, and common in Canyon Country. Gutierrezia sarothrae seedlings, which at first might appear to be some Conifer or Fern seedlings, are a great contrast to the golden shrubs shown above. But almost always, somewhere along the trail their true nature becomes evident when you find some seedlings with one bright yellow Gutierrezia flower at the very tip. 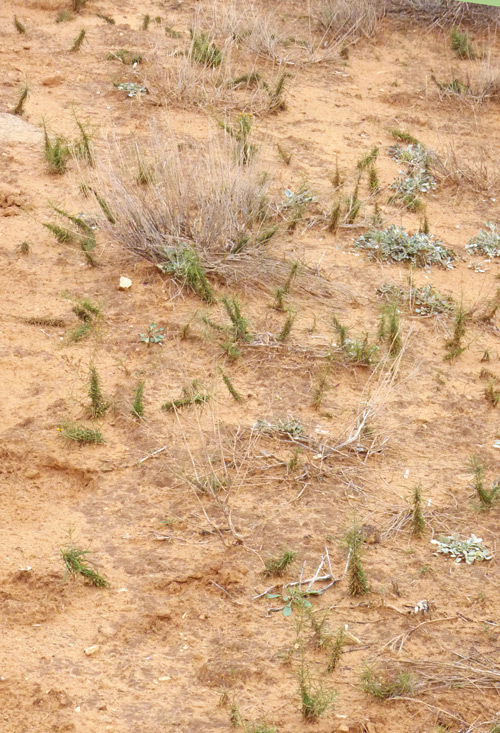 Typically one finds a scattering of seedlings, but warm temperatures and abundant moisture in the late summer and fall of 2010 produced a prodigious number of Gutierrezia sarothrae seedlings.